was the most profound peace I've ever known." If you have joined us on a pilgrimage, we would love to read about your experiences and post them on this website. Please contact us to let us know what you thought of the trip. Note that all testimonials are subject to review before publishing on the site. "I've felt the call to Medjugorje for several years. I visited the Marian Center and asked, "How do you know which tour group to go with?" The simple reply of "Oh, just ask Our Lady, she'll tell you," blew me away. Yet it worked. I repeatedly heard the name of Fiat Voluntas Tua from others, and it was the right choice. Walking to church daily while saying the rosary with my group, being present at Mirjana's apparition, and taking in many of the spiritual sites that Medjugorje and the surrounding areas offer helped renew my spiritual life. I plan on returning with Fiat often. May Mother Mary continue blessing this organization!" "My Medjuogorge pilgrimage was incredibly powerful and in large part due to the efforts of Fiat Voluntas Tua. We were granted every opportunity that Medjugorge had to offer: being present for Mirjana Soldo's monthly apparition, attending all of the beautiful religious services (confession is a must), climbing Apparition Hill and Cross Mountain, attending talks by the visionaries and local priests, visiting local religious communities and the list goes on. The presence of Jesus and Mary were palpable and the end result was the most profound peace I've ever known. What a joy to celebrate our faith with 30,000 fellow Catholics from around the globe. 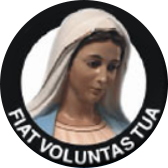 Our Lady is calling all of us to conversion and many to religious life through her messages in Medjugorge and I thank Fiat Voluntas Tua for helping provide the means to experience them first hand."